Fosmon's Recessed Low Voltage Wall Cable Plate is designed specifically for the installation of low-voltage cables and wires in walls to allow for cable management in the wall rather than externally. The design accommodates the space needed for speaker wires, coaxial, HDMI and data/communication cables. Perfect for flat panel TV's, surround sound systems, network/phone cables and audio/video devices. 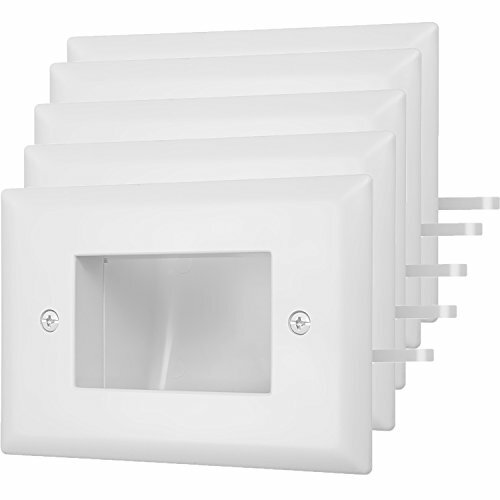 No need to purchase additional mounting bracket needed with most wall plates. This one has a fully adjustable mounting bracket built in. Plate mounts flush to the wall with the recessed design. Use it with any low voltage wiring such as telephone wires, network cables, HDMI, coaxial and speaker cables.